Spanish Joe, Fast Eddie, Harry the Horse, Little Bishop and Derby Don were enjoying the sights of nature at the Polski Weight-Lifting, Chess and Draughts Emporium when Johnny Double sauntered in and informed one and all that he had just seen Doc Venture and had learned how to apply psychology in chess games. Johnny’s real name wasn’t “Double”, but he was a big gambler and whenever someone suggested a bet would say, “Too small, let’s double it.” “In fact,” continued Johnny, “I can predict the moves of most players before they make them.” “So how are you going to do it?”, asked Fast Eddie, who had earned his soubriquet by being the best at rapid transit, and later, five minute chess. Johnny replied: “I will play blind-folded against Three-Bell Murphy, who will be White, and when I’m told that he has moved I will make my move without knowing what his first move was. The game will continue in such manner until I have a clearly winning position. After that I will play a normal blindfold game and will be told what his move is as soon as he plays it, because it’s impossible to guess what a player will do when he is losing.” “But what’s a clearly winning position to you may not be so clear to me,” said Harry the Horse, who was exceptionally adept at using knights. After much discussion it was agreed that Johnny must win a piece outright, or for not more than a pawn; or win the queen for a piece. Winning a rook for a bishop or knight, or winning the queen for two pieces, wouldn’t count. “Three-Bell Murphy is too weak,” objected Derby Don, who played the ponies and every year faithfully turned up at the Kentucky Derby. Three-Bell got his moniker from rapid-transit chess where a bell rings every ten seconds. After a few opening moves Three-Bell wouldn’t move when it was his turn, but would usually wait for two more rings. He was impervious to threats and pleas, but his opponents rarely claimed a win on time because they were winning anyway. Who would sacrifice the joy of checkmate by claiming a win by forfeit? For despite his extra “thinking time”, Three-Bell would inevitably lose. Joe always played the Spanish Opening: 1 PK4 PK4; 2 NKB3 NQB3; 3 BN5, also known as the Ruy Lopez, but it was well known that he had no money with which to gamble. “But if I lose I’ll give Joe a hundred dollars anyway,” promised Johnny. Another long discussion followed and it was decided to follow the normal laws of chess and if Johnny made an illegal move it would be put back and then if he could make a legal move with that piece he would be forced to play it. But if there wasn’t any legal move with that piece then he could make any legal move with a different piece. They all promised not to tell anyone of the bet and Trumbull approached Hamilton, who agreed to participate in what he thought was an ordinary blindfold exhibition. He would be using a chess set but Johnny would be in a different room, without board or pieces. Only a few select spectators would be in the room with Johnny. Harry agreed to act as courier and transmit the moves from one player to another. The game began and Harry went to Johnny and said: “Hamilton has moved.” Johnny thought: “Hamilton always plays the English Opening, 1 PQB4, so I will play 1 … PK4.” But Hamilton played 1 PK4, so the game began 1 PK4 PK4. When Johnny was told this he thought: Hamilton is trying to surprise me: what’s he thinking of? I bet it’s something like the old Center Game 2 PQ4 PxP; 3 QxP.” So when Harry told him that Hamilton had made his second move, Johnny quickly said: “I play pawn takes pawn.” “How did he know that?” asked Spanish Joe? “Just a lucky guess,” said Fast Eddie. The game actually went: 2 PKB4 PxP. When told what Hamilton’s second move was, Johnny knew that he was playing a King’s Gambit Accepted and thought: “Hamilton will play the King’s Bishop Gambit because Fischer always played it.” When told that Hamilton had moved Johnny said: “My third move is pawn to queen four.” The moves actually went: 3 NKB3 PQ4. “He should have played BQB4,” said Little Bishop. Johnny thought: “Hamilton likes to develop his knights and will play NB3.” When told that Hamilton had moved Johnny said: “My move is knight to bishop three.” “Which bishop three?” asked Harry. “Oh, king bishop three, of course,” said Johnny. The game actually went: 4 PxP NKB3. After learning this, Johnny thought: “Hamilton will protect his pawn with PQB4 so I will play 5 … PB3.” The game actually went: 5 BQN5ch PB3. “How did he know he was in check?” asked an amazed Spanish Joe. No one answered. Johnny thought: “Hamilton will probably keep the pawn pinned by 6 BR4, so I will play 6 … NXP.” The game actually went 6 PXP NXP. After this Johnny was puzzled: “I haven’t guessed right yet! Every move Hamilton has made has been different from what I expected. However, he will certainly play 7 PQ4 in order to capture the KBP with his bishop. White doesn’t have a bad position so I think I’ll surprise him and play queen to knight three and then castle queen-side.” But Hamilton had been told the danger of leaving his king on an open file and decided to castle into safety. Therefore the game went: 7 Castles QN3ch. When Harry told him Hamilton’s seventh move, Johnny knew he could win a piece, but which piece? 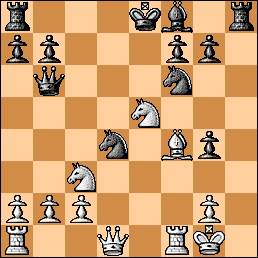 White’s only sensible move was 8 PQ4, but what if Hamilton played 8 NQ4? That’s the kind of move that is used to “trick” the blind fold player. Johnny knew he could try the fool-proof queen takes knight check, and if that were not legal could then play queen takes bishop, but so far hadn’t taken back any moves and was conceited enough to want to keep his record perfect. So when told that the eighth move had been made by Hamilton, Johnny said: “I play queen takes bishop.” The actual moves were 8 PQ4 QxB. Time out while Fast Eddie, Spanish Joe, Harry the Horse, Little Bishop and Derby Don consulted and agreed that Johnny had a “clearly winning position”. The game then continued with Johnny being told what Hamilton’s move was as soon as it was played, and before he replied to it, but Johnny was still without sight of board or pieces. 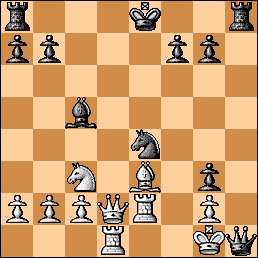 The game continued 9 NB3 QN3; 10 BxP. Johnny wasn’t tempted to capture White’s QNP. 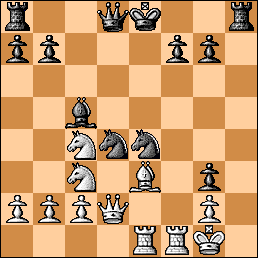 In the first place, White had a great lead in development, which made 10 … QxP/b2 dangerous. In the second place, Black was a piece ahead and didn’t need White’s QNP to win the game. And in the third place after 10 … QxP/b2; 11 QK1ch, Black would be forced to play the unpleasant 11 … KQ1, because if 11 … BK2; 12 PQ5 NQN5; 13 PQ6, White would win back his piece. After 10 … QxP/b2; 11 QK1ch KQ1; 12 NKN5 BK3, what can White do? Probably 13 NxBch PxN; 14 RQN1 QxBP; 15 RxP. 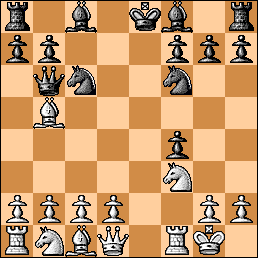 There might even be better moves for White, such as 14 PQ5 NxP; 15 NxN PxN; 16 RQ1, etc. Therefore, Johnny played 10 … BKN5 and Hamilton replied 11 PKR3. “What’s that?” thought Johnny. “I can win the queen pawn with 11 … BxN and 12 … QxQPch. Is that good? I need to checkmate in 22 moves and if queens are traded I don’t think it can be done. But what if I sacrifice the bishop? After 11 … PKR4; 12 PxB PxP, the KR file is open and White is practically mated. White must move his KN and then Black can play 13 … NXP, threatening discovered check. Then if 14 BK3 BQB4 or 14 … RQ1.” Johnny played 11 … PKR4 and Hamilton didn’t hesitate winning his piece back with 12 PxB. After 12 … PxP; 13 NK5 NxP, Fast Eddie could see mate coming soon and asked: “how many moves have been made?” Johnny hoped for 14 NB4 attacking the queen, … NB6 mate, but Hamilton saw the discovered check and played 14 BK3. After 14 … BB4; 15 NB4, Johnny thought of playing … QB2, but rejected it because White could play 16 RB4. So he played 15 … QQ1. Hamilton suddenly entertained thoughts of winning the game as he had won back his piece and was ahead in development. The black king was in the middle of the board and Black’s pieces were going backward! Fast Eddie saw a clever trap with 16 QK1 NxP; 17 BxBch NxQ; 18 QRxNch KQ2; 19 RQ1ch KB3; 20 RxQ QRxR; 21 BK7 RQ5; 22 NK5ch KN3; 23 BxN PxB; 24 RxPch and White should win. But Hamilton played the obvious 16 QQ2 and Johnny played 16 … PN6. Hamilton was optimistic as he completed his development with 17 QRK1, threatening discovered check, but Johnny played the surprising 17 … NK5, attacking the queen and putting the knight en prise. Derby Don expected Hamilton to play 18 NxN and get mated after … RR8ch; 19 KxR QR5ch, etc., but Hamilton wondered why he was being offered a “free” piece and found the inspired 18 NQ6ch. “How many moves is that?” asked Derby Don, as he thought there was a good chance for Hamilton to avoid getting mated in 22 moves. Johnny saw 18 … QxN; 19 NxN, so he played 18 … BxN and still threatened … RR8ch. Hamilton found the best defense: 19 BN5, but was surprised by 19 … NK7ch. He then saw … BB4ch coming and knew it was almost hopeless, but did the best he could with 20 RxN, and the game concluded with … BB4ch; 21 BK3 QR5; 22 RQ1 QR8 mate. The spectators burst into applause and Johnny graciously accepted their congratulations. They then repaired to a Chinese restaurant for their usual twelve-course dinner and re-hashed the game, where it was discovered that if Johnny had played at QR-odds he still would have won! “Stuff yourself,” said Johnny, “I’m buying.” “With whose money?” they thought.